Boiling eggs without cracking shells, a very easy matter if you apply a little science. Forget the old wives' tales about adding salt, vinegar or un-burnt matches to the water. That doesn't work; at least, not consistently. The trick to doing this? Quite simple, really! Objects expand and contract, when exposed to extreme temperatures. Plunging a refrigerated egg into boiling water (going from 40ºF. to 212ºF.) can only result in cracking. So, to keep an egg shell from cracking, just warm it up before boiling it. This reduces the temperature differential between the liquid inside of the fragile egg shell and the surrounding water. Without cracks, Easter egg dyes can't enter and stain the egg whites. Hard boiled eggs, perfect for picnics or brown-bag lunches, egg salad or deviled eggs. 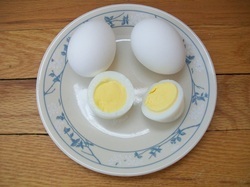 Boiled eggs; full of essential vitamins, minerals, antioxidants, protein and unsaturated fats; whether white or brown. 3. Remove from heat and carefully transfer eggs to a colander to drain and cool under cold running water. If you intend to use them as an appetizer, eggs peel the easiest while the egg is still slightly warm on the inside. * Raw eggs which stand on end, but do not float, should be used in egg salad to cover the slightly-off taste. * Using cold filtered water? Set Heat/flame to lowest until a few minutes AFTER water condensation has evaporated from the outside of the pot, before bringing to a boil. * Covering the pot will cause the water to boil in less time, since it helps to retain heat. * Keep them warm, if they're to be dyed as Easter eggs. Warm egg shells absorb more food coloring and make prettier dyed eggs. * Season boiled eggs with Old Bay seasoning, cracked peppercorn medley or a dash of hot sauce. * If you would rather use an egg cooker, warming the raw eggs first still applies. * Raw eggs which float completely should be thrown away. * Plunging refrigerated eggs into boiling water causes micro-cracks in the shell which expand as the eggs are cooked. Use water no hotter than 90ºF to pre-warm them, before bringing them to boil. * Overcooking leads to the (harmless) greenish layer on cooked yolks. * Plunging eggs into boiling water can also cause burns from splashing. * Do not warm or attempt to microwave a raw egg IN THE SHELL. The egg will explode!